euroquatics e5euroquatics e5The Euroquatics E5 Retro Series LED tubes are a very promising step in the advancement of LED aquarium lighting, and it’s the holy grail for a whole generation of faithful T5 lighting users. Tens of thousands of reefkeepers have stuck to their fluorescent T5 lamps while watching the solid state lighting revolution take hold of the wider reefing hobby. Users of the new LED light have had mixed successes from better than ever, to lots of problems, and everything in between. All along we’ve been saying that there’s nothing exotic about the type of light that is produced by LED lighting, but the way we’ve been using them creates a dramatically different light ‘field’ than the blanket of light that comes from having a battery of T5 lamps. With the E5 Retro Series LED tubes we now have a convergence of the benefits of LED lighting and the even lighting field of fluorescent lighting. LEDs offer longevity, energy savings and heat reduction and some improvements to the blue end of the lighting spectrum. Meanwhile the tubular form factor distributes light over the reef tank in a way that is much more familiar to fluorescent lighting technology which we’ve enjoyed for three decades now. At Reefafapalooza this past weekend we got the chance to go hands on with the Euroquatics E5 Retro Series of tubes and we have to say, there’s not much to them. The Euroquatics E5 tubes are the most innocuous and underwhelming little devices since they look and function nearly identical to standard T5HO fluorescent tubes, but all the good stuff is on the inside. 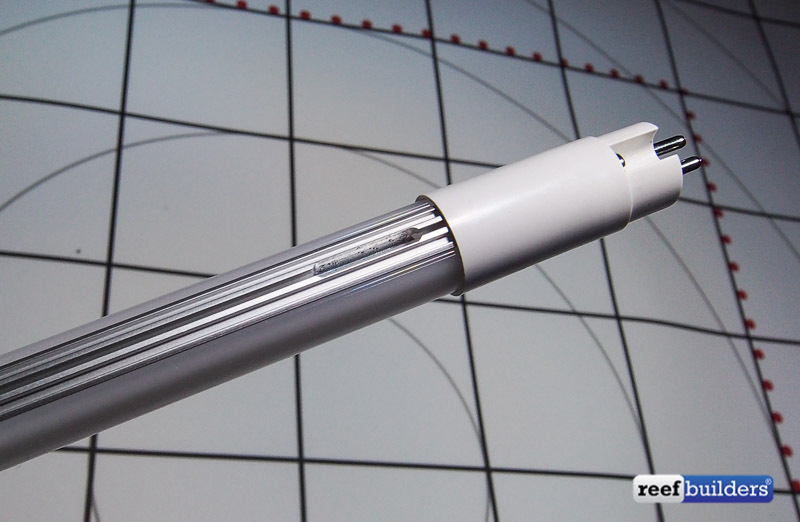 The E5 Retro Series LED tubes are the same half inch diameter tubes as T5, with the same pins, but they have a white cover which extends over the tube for about 1.5″ more than a standard T5 ‘cap’. Furthermore, a very thin strip of aluminum heat-sink runs along one side of the tube to help manage LED temperature and dissipate heat. We saw the new LED tubes go head to head with a pair of new and normal flat white T5HO fluorescent tubes and there’s virtually no difference in brightness. The color is really similar between the fluorescent and LED tubes, but with the use of a Killawatt meter it’s easy to see the 45% reduction in power when using the E5 Retro Series. Unfortunately, Euroquatics only had their 10K Daylight E5 tubes to show off so we didn’t get a chance to evaluate their four other colors that include tropical daylight (6500K), Cool Daylight (15,000K), Blue Pop (450nm) and Marine Pink. The cost of the E5 Retro Series is also quite reasonable, being priced at $49 for a two foot, $59 for a three foot, $69 for four foot and $79 for five foot units that will hot-swap with your existing T5HO fixture. There’s no UV version of the E5 retro series but fluorescent lamps are UV lamps and so if you’ll want to use the E5 retro series in conjunction with regular T5 lamps to truly get the best of both worlds. The E5 Retro Series LED tubes are expected to last up to 8 years of real actually useful brightness, and we imagine that the reduced power load on the T5 ballast will also help those live longer too. Whether you want bulbs that run longer, that run cooler, that use less energy, the new Euroquatics E5 Retro Series have a huge potential to be a powerful new force for merging the best worlds of both T5 and LED lighting technology. All that’s left to do now is for the new LED lamps to actually get released to the public so we can see how all the claims hold up in real world testing and growing of our beloved aquarium corals. We’ll all get a crack at them in December or January when the E5 are expected to be ready for delivery to the wider marine aquarium hobby.